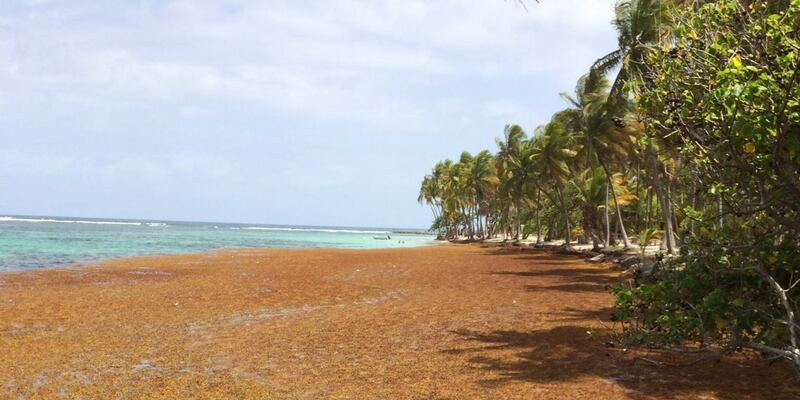 The Sargasso : an environmental scourge to the dramatic consequences affecting the whole of the Caribbean. Of many sur-pollutions related to the fight against the Sargasso are induced by inadequate barriers projects. 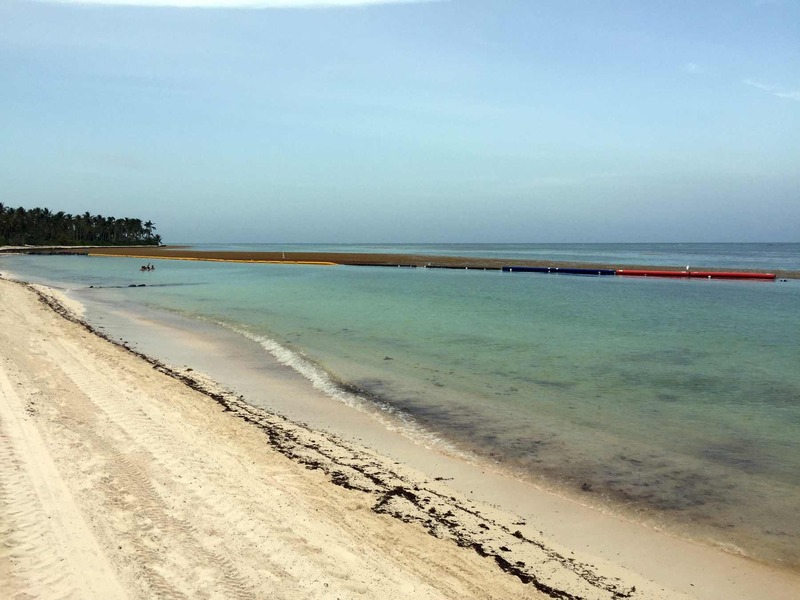 Concrete and rapid solutions exist and allow the almost total elimination of the Sargasso. 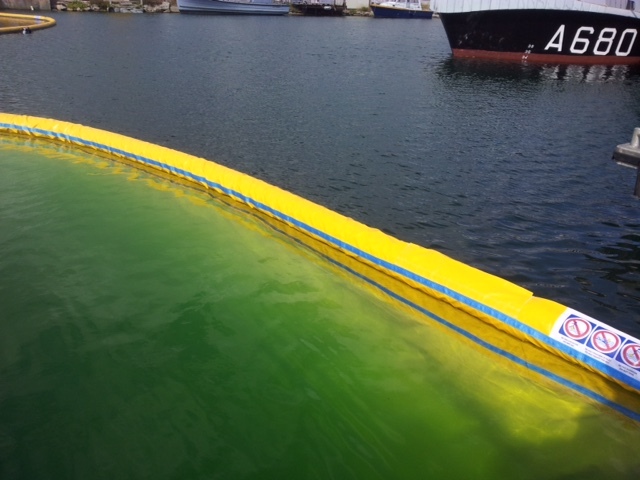 Example of a barrier of 7 km with its maintenance system, cleaning with a revolutionary barge that harvest directly the sargasse at sea. Economic, because the accumulation of algae on the beaches was a major problem for tourism exploitation. The fishing and aquaculture sectors are also affected. While environmental issues are now at the heart of the concerns, the collection of seaweed Sargasse before its stranding on beaches becoming a first-rate economic and ecological necessity. Attempts to combat this phenomenon of pollution have been undertaken. 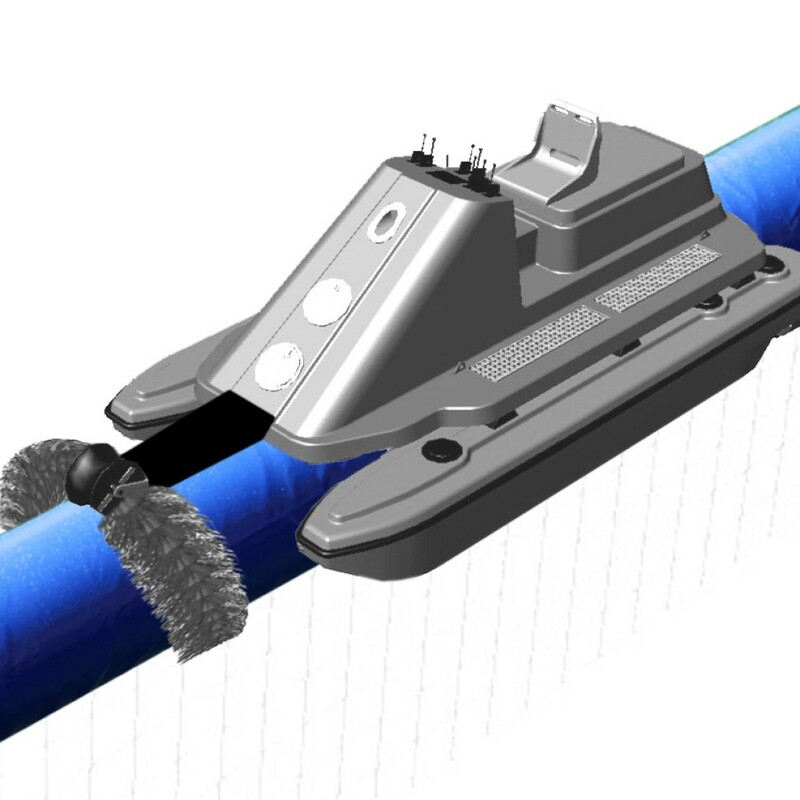 Nonconforming or inappropriate dams have been installed, they broke apart quickly, debris runaway is stranded on the sides and contributed to an additional pollution. Artisanal and little effective modes of collection have also been implemented and were paradoxically for a long time an obstacle to the release of this sector of clean-up to eventually give way to more efficient. Currently, local actors, in the face of the seriousness of the situation and aware of their interest in protecting the ecological heritage of their regions are now ready to be open to other proposals. Of many sur-pollutions related to the fight against the Sargasso are induced by inadequate barriers projects : inventory. Since 2010, the development of Sargasso was exponential due to agricultural pollution in the basin of the Amazon and a rise in temperature due to climate warming. 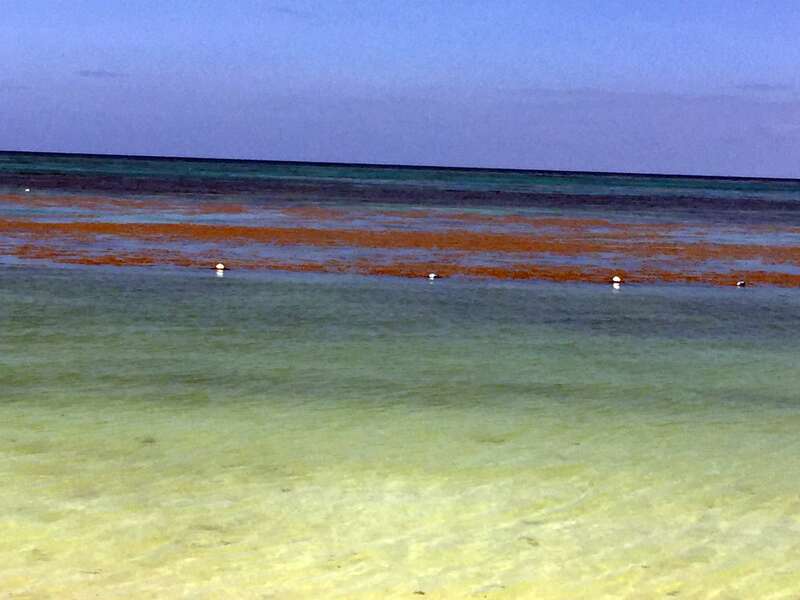 The currents cause the drift of huge benches of this floating Brown algae which sometimes extend over several dozen hectares to the Islands Caribbean and the coast of the Gulf of the Mexico. 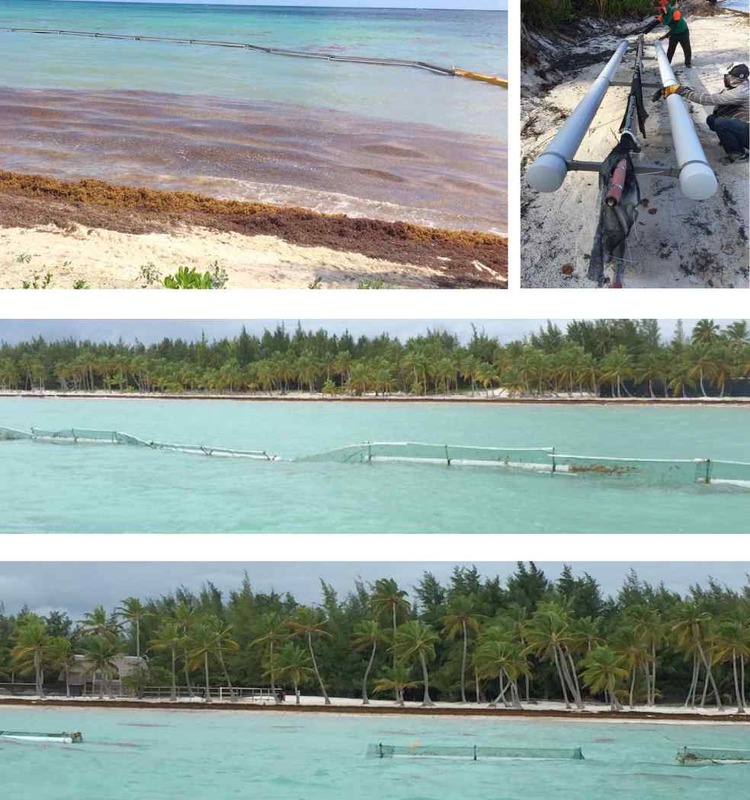 These gigantic Sargasso strandings are a scourge economic and environmental. The beaches are overrun and become impassable. The Sargasse is a real health problem, It is allergenic and makes so swimming impossible. After stranding, it ferments and gives off a stench. The most frequently used solution is cleaning the beaches using bulldozers. Tons of contaminated sand mixed with decomposing algae are collected, This process causes an irreparable erosion of the beaches. The back and forth incessant public works machinery and noise pollution make ar beaches during much of the day. This sand-seaweed mix collected is then crammed into spaces requisitioned for this purpose and continues to rot in the open air. For kilometres round residents are bothered by the smell, children suffer from respiratory problems due to the toxic fumes. 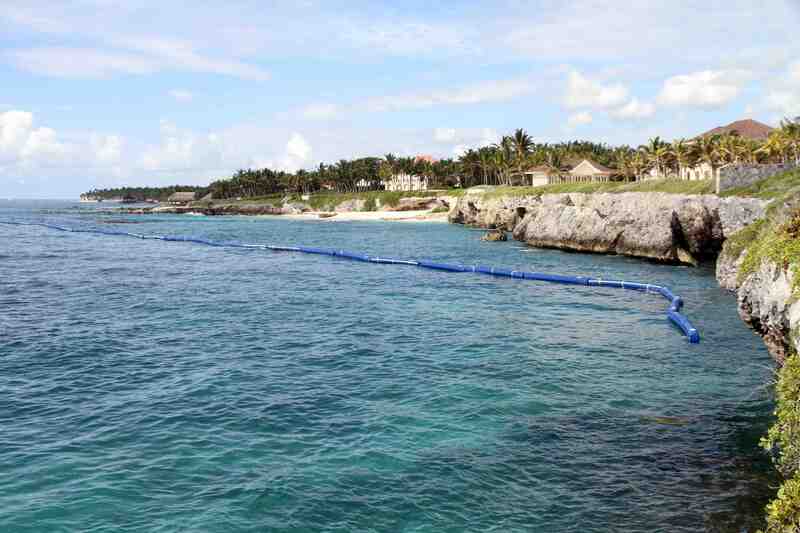 Companies offering this service of cleaning the beaches bring no solution. This counterproductive method and anti ecological only effect is to ravage the beaches and move the pollution by trying to hide. Our group, the AlgeaNova company belongs specializes in floating dams. We have decades of experience in the areas of protection against hydrocarbons, the underwater protection of ports and marinas to preserve funds during the underwater work, the protection of the beaches from the jellyfish with our patented floating barriers, as well as many more specific projects for specific protections. 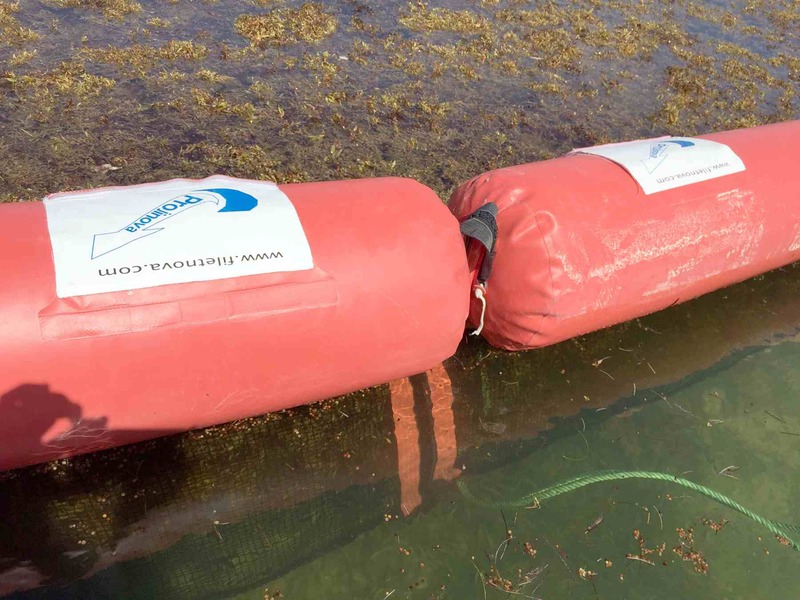 For more than 2 years our group has invested nearly one million euros in research and development in order to find an appropriate response to the problem of the Sargasso. Many trials of inappropriate barriers, designed by companies not specialized in this area have been made without success. Visual pollution due to the design and a poor choice of materials. Structural weakness due to the rigidity, causing their breakup. The use of systems designed for specific protection against hydrocarbons. Their temporary anchorage devices for very limited operations in time can’t resist weather and rarely more than a couple of months. 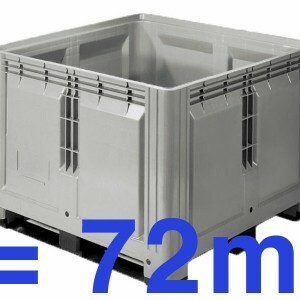 The installation of a barrier of this type, with a length of 7 km without including the anchors involves enormous means of storage in terms of floor area, dozens of transport trucks and very important logistics. 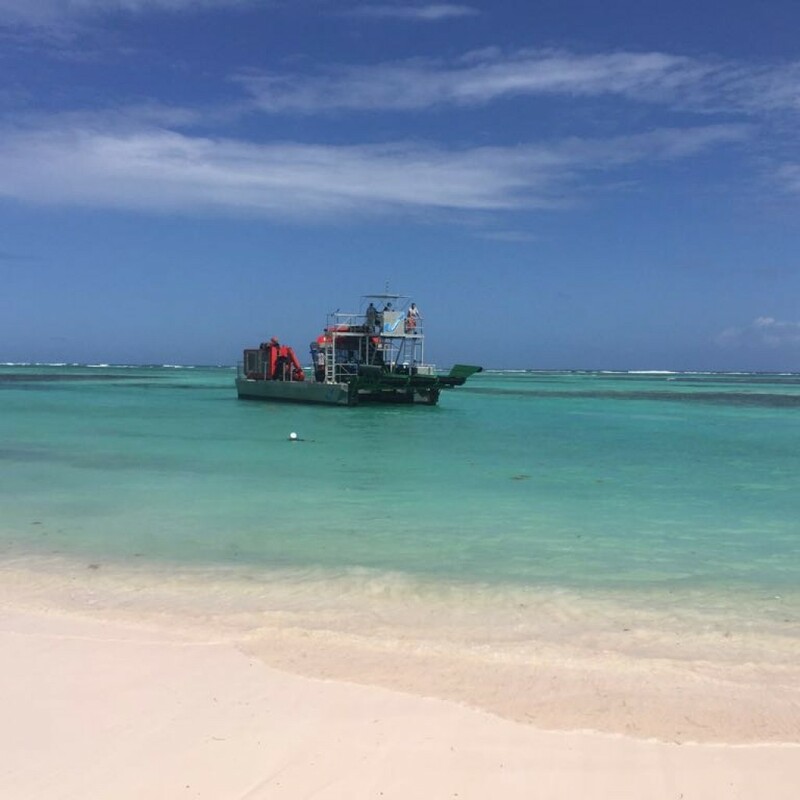 For maintenance, He takes every day several boats as well as 20 employees for repairs at all times, replace the damaged sections and store them ashore, without a solution to recycle a somehow should be considered. For the cleaning of these dams to keep them in State, a significant amount of labor and of boats is needed to ultimately get a poor result. The present rigid dam in addition the risk of injure bathers or cause of human and material damage If a pleasure boat up against them.. Barrier installed on more than 1 km destroyed on 20 m by a somewhat heavy seas. The parties having resisted are gutted and foams using float escaped. These wastes have caused the death of turtles, Some birds and fish. In less than a year, the remaining facilities were dismantled and stored ashore. This unusable material which remains abandoned creates an additional land pollution. The Caribbean area is especially exposed to the risk of hurricanes. During the cyclone season the ideal is to dismantle the installations and store safe, but all existing barriers are not removable. The human and technical resources to implement do not consider dismantling and the necessary storage surfaces are too large. At the end of the hurricane season most of these dams were in the water is destroyed and reclamation costs are very important. As a first step, our group has refused to sell its gates because we felt them incomplete. 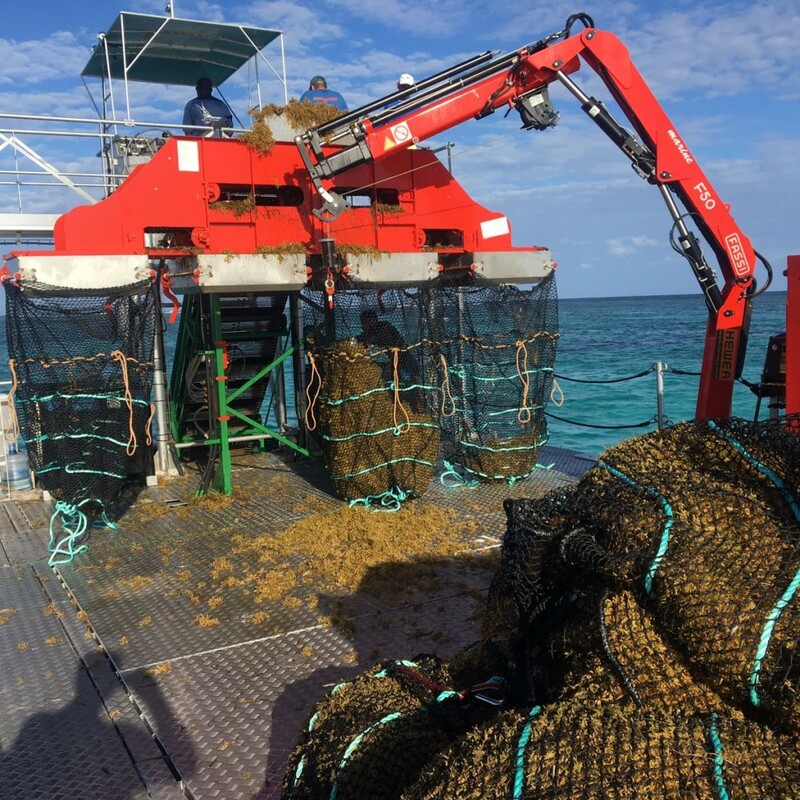 We preferred to wait and undertake a series of studies to analyze all the barriers of the market to determine the negative points of inadequate systems to address the problem of the Sargasso. At the end of months of research, our engineers have the first conclusions and we started to realize prototypes. 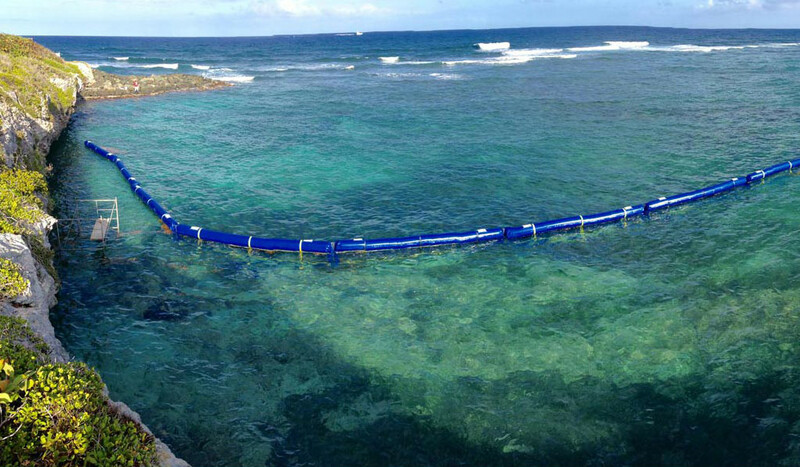 After more than a year of research and more than a dozen prototype installed at sea to study the behavior of the barriers in the face of the elements and their ability to effectively retain algae we decided to install Punta Cana Punta Cana Group partnered with a barrier of 200 m.
Our anchors are specially studied and adapted to the place and conditions of implementation. We apply very important safety factors, our barriers are anchored with at least 3 times more anchorages than our competitors. To be competitive most of the companies on this market minimize their supply and run so the risk of the total loss. Our choice is determined by the result of studies and tests conducted at sea. The multiplication of our anchors penalizes our price, but we are convinced of this need to be able to guarantee the quality of our facilities. To be closer to our customers in the Caribbean our group has created the company AlgeaNova. We are to the facts of the problems, and this proximity allows us to better listen to improve our services according to your needs. Transport of the barrier in only 2 40 “containers for 7 km long. They are flexible since inflatable. For the maintenance of 7 km, two employees can daily carry out complete control. Details of the procedure of control following. If necessary we can clean daily the 7 km of barriers with two employees. Details of the following cleaning procedure. 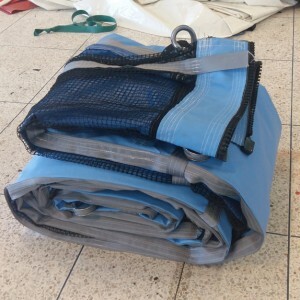 One of the advantages of a flexible, inflatable system is to be safe. Our inflatable gates are safe for swimmers and boats as well as for their passengers in a collision with the dam. In summary our barriers have incomparable advantages, their anchor system, their weight, their volume, the ease of dismantling at sea, storage ashore and discount in place, make a product unique and effective. We are only able to offer the disassembly and complete in storage 3 to 4 days of the gate with a small team at the announcement of an imminent cyclone. At the end of the bad season we give the barrier in place with reduced resources and a small team of 5 to 6 employees during a week. With all these benefits your investment on the fence is protected. The barrier protects your beaches, But what happens to the algae that crowd behind this dam? they are still floating and living and do not yet represent an olfactory pollution, they are fresh and clean. 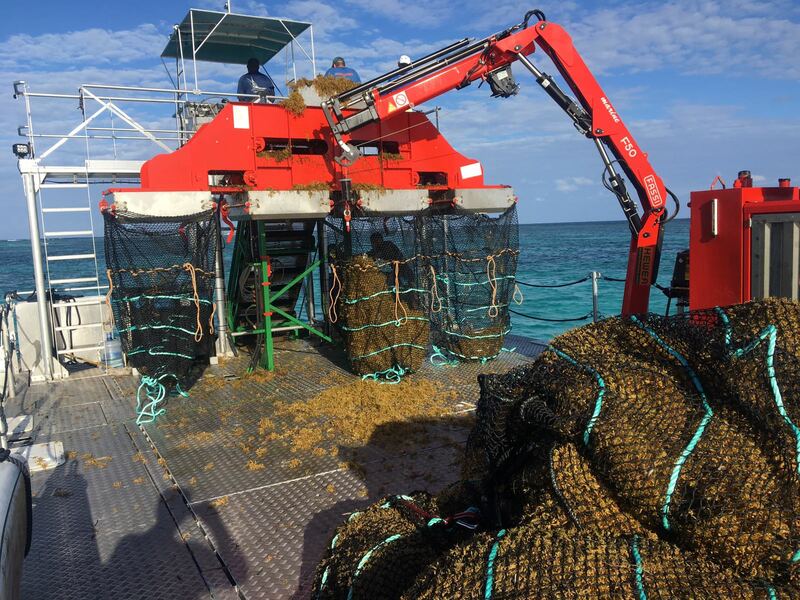 We therefore studied an able to harvest industrial barge 80 tons of Sargassum on time, put them in bags and carry them easily to our site of treatment to change them and value them. Our system is designed to combat this pollution by advocating a complete system not to move the problem. Our barge of pickup is not comparable to existing systems that can be found on the net and have a capacity of collection of 20 to 30 tons per day to the more efficient. The purpose of these proposals still remaining to get rid of the Sargasso Sea on the ground, letting them rot and so pollute a land area. In the procedure developed by AlgeaNova we collect algae clean and fresh before their stranding, Thus we protect and preserve the beaches. After their unloading on our site of treatment, We dry them in our specially designed environmental dryers and running practically only using natural resources. For the maintenance of barriers we applied to find solutions to reduce costs and the time of labor. For the maintenance and cleaning of our barriers 2 employees are sufficient. We studied and developed a jet ski equipped with brushes and pumps high pressure to wash the barrier. At the same time operators check if an item is deflated and in this case, They rebound with the compressor that is on board. If the item is damaged they replace it immediately in 15/20 minutes. The speed of cleaning is more than 1,5 to 2 km per hour is 3 to 5 hours to wash properly the 7 km of fence, on the surface for the float and underwater for the net from a height of 1 meter. We believe that the frequency of cleaning is not necessary more than one to two times a week maximum. In summary, the days of maintenance of the fence the duo of maintenance, will carry out the cleaning and maintenance of 7 km in 6 to 7 hours only. For days without cleaning less than a half day will largely suffice. Washing of 7 km once to twice per week. In quantity and without nuisance algae collection. At your disposal for all further information and make you an offer tailored to your needs.